Skk Mobile has just announced a new affordable smartphone packs 5 inches display with dual core processor called the Kraze. 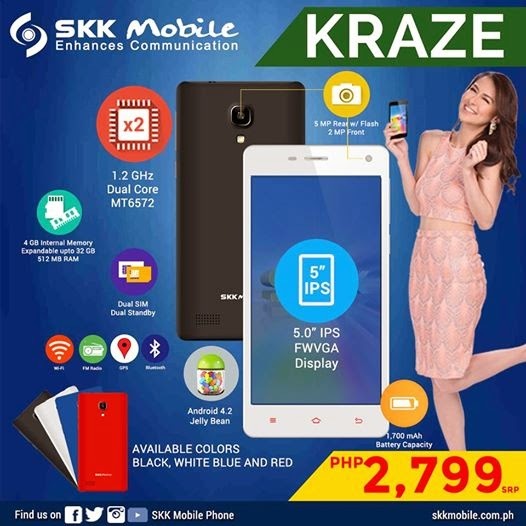 The new Skk Kraze is carrying MT6572 Dual Core chip which clocked at 1.2Ghz with 512 MB of Ram and 4 GB internal storage than can be expand up to 32 GB via micro SD card. This dual sim/ dual standby android phone is equipped with 5 megapixel with flash rear camera and 2 megapixel on front. With1,700 mAh battery, the SKK Kraze ship in an Android Jellybean operating system. It is available in Black, White, Blue and Red color variant for only P2,799. malakas ba ang data connection? gsto ko bumili nito.